My self, my sister, mother and father were waiting in our car to enter the Highland Drive-in Theater in Salt Lake City. We saw a silver (metallic) colored disk shaped craft hovering in the air a few blocks east of us, between us and the mountains. It made no sound and didn’t have any lights, it just hovered (was still) in the air, then it headed north along the face of the mountains at an incredible speed, it was out of site in a second. It then reversed its course (it was out of site when it changed direction) and came back along the same path heading south along the face of the mountains until out of sight. This was seen at dusk, the sun had just set, but it was still light and we saw it clearly. 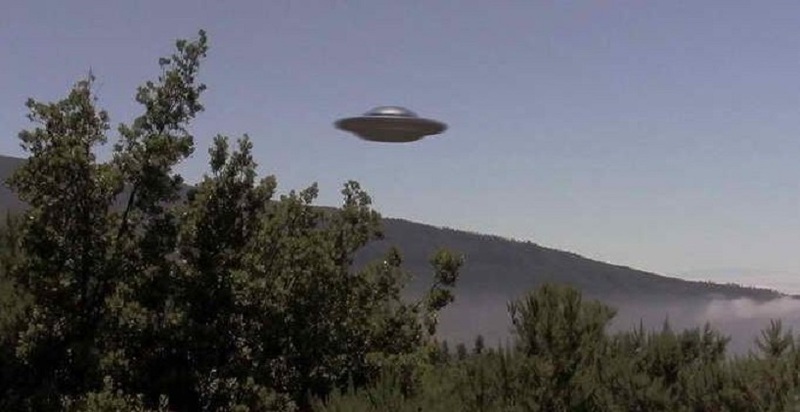 It looked like the classic flying saucer, metallic, disk shaped, thicker in height in the middle and tapering to the outside edges, with kind of a dome shape in the middle on both the top and bottom, the bottom dome shape smaller than the one on top. It kept the same altitude the whole time, while hovering and moving (did not go up or down), just hovered went north out of site, then came back from the north and went south until out of site. Other people at the drive-in also saw it, everyone looked but no one said anything or really seemed to react to what they saw (once it was gone no one said anything just continued as if nothing had happened). Shock perhaps? My older sister was at our home on the west side of the valley sitting outside on the porch at that time and also saw it, our home was on a hill with an unobstructed view of the north and east sides of the valley. I remember my parents reading a short article in the newspaper a day or two later about people reporting seeing this disk. My family did not report it then. I can’t remember the exact date, but it was summer 1967 a Friday or Saturday and the full moon about midway in its path across the sky. I looked up full moon time in the summer of 1967 and reported the July 21 date because that is the only date that the full moon would have been in that position in the sky that summer on a Friday or Saturday. NOTE: The above image is CGI. This entry was posted in ABDUCTION, best ufo photos, incredible ufo photos, MISSING TIME, top ufo news, UFO, UFO ARTICLES, ufo news, ufo photos and tagged 1967 .................. SALT LAKE CITY UTAH My self, 1967 UFO DISC UTAH, 7-21-67 SALT LAKE CITY UFO DISC, ABDUCTION, ALIEN CRAFT, animal abduction, army ufo, AUGUST 10, best ufo images, best ufo photos, best ufo pictures, best web site world ufo photos, biggest ufo web site, boomerang craft, chief investigator, CIGAR, civilian panic, CLASSIC FLYING SAUCER ENCOUNTER IN UTAH JULY 21, commercial pilot ufo, COSMOMAUTS ALIEN ENCOUNTER, crashed disc, CYLINDER, cylindrical craft, diamond ufo, DISC, disclosure, discoveries on mars, discoveries on moon, FLYING SAUCER, government black ops, I.S.S. UFO, incredible ufo photos, international space station and ufo alien craft, JULY 21, KEN PFEIFER, ken Pfeifer discoveries, Ken Pfeifer State Director for MUFON in Rhode Island, Ken Pfeifer State Director for MUFON in Vermont, largest ufo photo website, largest ufo web site, largest ufo web site in the world, LIGHT, LIGHTS, marine ufo, MARS, mars discoveries, mars photos, MEN IN BLACK, MISSING TIME, MOON, moon discoveries, moon photos, MUFON, national press club ufo, navy ufo, no disclosure, ORB, ORBS, pfeifer, PIEDMONT MISSOURI ALIEN ABDUCTION, pyramid ufo, radio ken Pfeifer, rectangle ufo, RUSSIAN UFO, SALT LAKE CITY UTAH DISC UFO, Saturn discoveries, saucer, secret society, SPACE ENCOUNTER, State Director Ken Pfeifer for MUFON in New Jersey, STRANGE, sun photos, swamp gas, top ufo news, TRIANGLE, ufo, UFO ARTICLES, ufo crash, ufo news, ufo photos | Tagged air force ufo, unidentified submerged object, unidentified submerged objects, uso, UTAH UFO, world largest ufo web site, world ufo photos and news, world ufo photos is the largest UFO photo website in the world by KEN PFEIFER. Bookmark the permalink.